(CBS News) Organ donations saw a spike after Facebook added a feature to Timeline Tuesday that allows users to register to become organ donors. 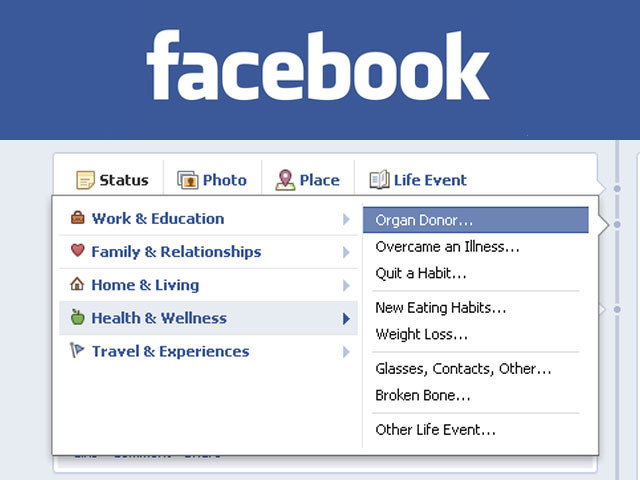 Facebook users who are already organ donors can add that information to their timeline. Results from the launch are staggering. Within hours of Facebook's announcement, the registry Donate Life California reported donor signups increased by 800 percent compared with Monday. By 5 p.m. PT, the number of signups grew by 1,400 percent, the organization reported on their Facebook page. "This graphic of the registration spike today on the donateLIFEcalifornia.org registry says it all - a nearly 1400% [sic] increase as of 5 p.m. today. Thank you, FACEBOOK, for offering hope to people on the waiting list! Phenomenal!" the organization shared on their website. Facebook chief executive officer Mark Zuckerberg said his friendship with Apple co-founder Steve Jobs, who had received a liver transplant before he died last year, helped spur the idea, as did talks with his girlfriend Priscilla Chan, a medical student. Donate Life America, the nonprofit that's partnering with Facebook, reports that over 112,000 Americans are waiting for organs, with 18 deaths every day from a lack of available organs. Facebook is the world's largest social network. The Menlo Park, Calif.-based company has 901 million users and reported $3.7 billion in revenue in 2011. The company filed for its IPO on February 1, with Morgan Stanley as its lead underwriter and the ticker symbol "FB."